Potable water supplies in many areas of the United States are limited, and demand continues to grow. The challenge is to find solutions to maintain the quality of golf while using less water. 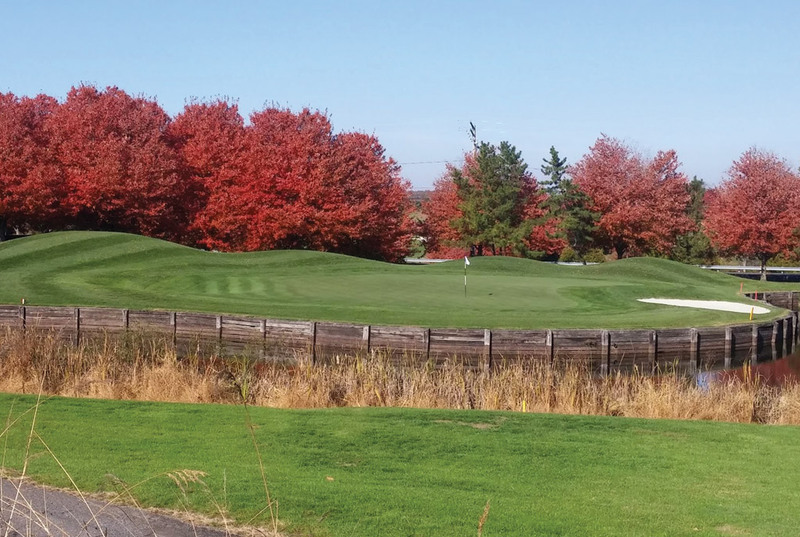 Opportunities to conserve water exist when courses are initially designed and during renovation, during irrigation system design and use, and by incorporating the use of management zones. Some courses are designed using a “target golf” concept that minimizes the acreage of irrigated turf. If properly designed, water hazards and stormwater ponds can capture rain and runoff that may provide supplemental water under normal conditions; backup sources may be needed during severe drought. During times of intense heat stress, syringing, or the practice of applying a small amount of water to turf to help cool the plants as it evaporates, may be beneficial under certain conditions. These conditions include turf with a very shallow root system, turf compromised by disease or poor soils, or wet-wilt. Because the cooling effect of syringing is very brief, repeated syringing and/or the use of fans will maximize the cooling effect. In addition to utilizing well-adapted cultivars for the in-play areas of the course, existing golf courses can convert out-of-play area turf to naturally adapted native plants, grasses, or ground covers to reduce water use and augment the site’s aesthetic appeal. Native plant species also provide wildlife with habitat and food sources, such as native flower areas that benefit pollinators. After establishment, site-appropriate plants normally require little to no irrigation. The Maryland Native Plant Society provides information on native plants in the state and the National Park Service offers information on native plants for Maryland. A list of drought-tolerant plants for landscape beds is available in Xeriscaping and Conserving Water in the Landscape. 2001. University of Maryland Extension. Superintendents can plan ahead by developing a water conservation plan to achieve a 10% reduction in water use before mandatory water restrictions are enacted. Communication should be maintained with water managers, golf club members, and the public to explain your water conservation efforts as a proactive approach to addressing water-related issues. Select drought-tolerant varieties of turfgrass to minimize water use. Utilize hand watering or targeted irrigation to conserve water. Control invasive plants or plants that use excessive water. Reduce the amount of area on the golf course that is irrigated, if possible, such as non-play areas. Operate the irrigation system to provide only the water that is actually needed by the plants or to meet occasional special needs such as salt removal. Identify opportunities to achieve water use reductions before mandatory water restrictions are enacted in times of drought. During a drought, monitor the state’s drought status to ensure compliance with restrictions. 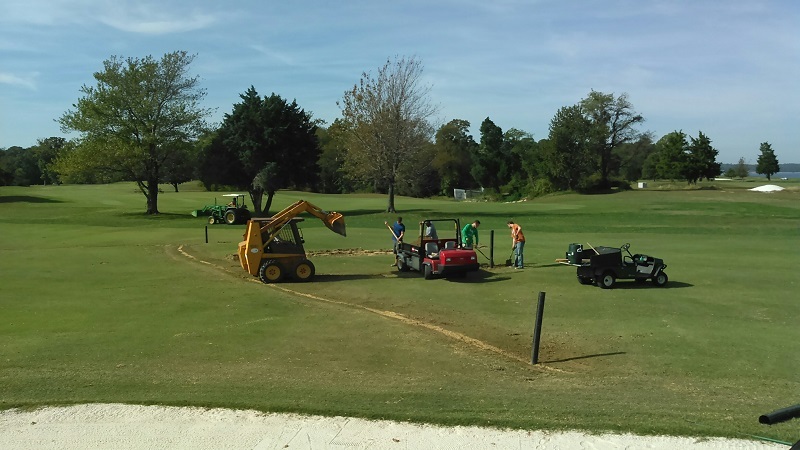 Drainage project on #18 fairway at Cedar Point Golf Course. Water is carried back and empties into an irrigation pond providing up to 1 million gallons of recovered rainwater each year. Photo credit: David Burkhart. 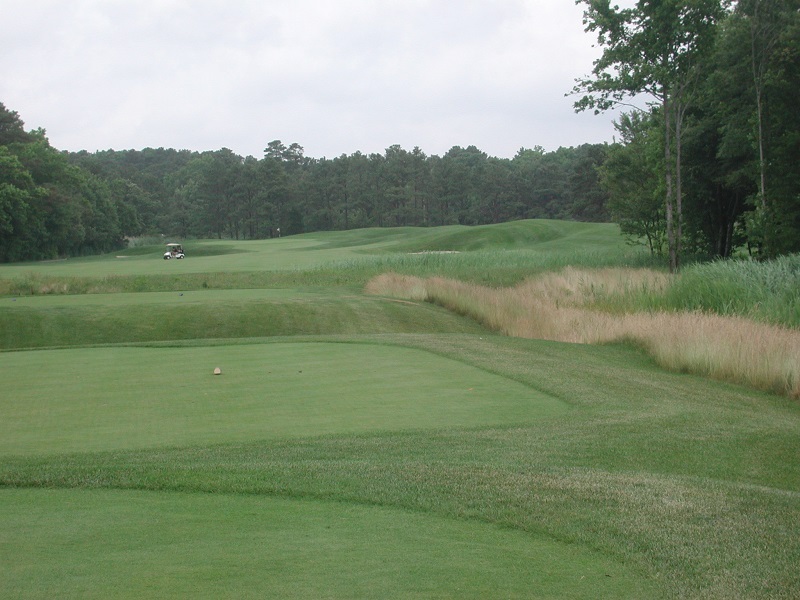 Use of native grasses in the rough can help to reduce water use and augment the site’s aesthetic appeal. Photo credit: Tom Turner.